The last chick (the female) left the nest about 9:30 this morning. She seemed to have a strong flight and her mother, Rebecca was right by her side as you see in the photo. They flew to the far side of the bank building and were out of sight of the faithful falcon watchers. Although numerous pairs of eyes scanned buildings looking for her, she was not spotted. A safe landing was assumed since there were no reports (at that time) of a grounded bird. After a first flight, most young falcons rest a long time before flying again and it is not unusual for them to flatten out on their bellies and be hard to see. However, about four hours later, she ventured out for another flight – this time with a less successful landing. She hit a window and was then spotted on the mall by numerous fans who took the time to call and text, get boxes, ladders, and watch over her until help arrived. THANK YOU TO EVERYONE!!! She managed to get into a very deep window well which did require the ladder (THANK YOU TO THE IRVING’S STAFF) and helpful bystanders to assist with the railing vault! Falcon fans were eager to help and she was scooped up with due haste. She will join her brother in rehab to be sure that she can fly and does not have any injuries. One of her wings looks a bit droopy, so we hope that it may just be some bruising from the impact and not a severe injury. She was certainly bright and alert and feisty when found. Her brothers are doing well. Brother number 1 who fledged very early and is in rehab has started to fly but seems rather nonchalant about it. His flight instructor is planning to implement a more boot camp approach rather than the self-study program he has undertaken. Having his sister on board may increase his motivation to practice his flying skills. Brother number 2 has certainly improved in flying and landing and seems to have more control over both aspects. He is now making landings that seem intentional rather than accidental. He made it back to the nest box today and scored some nice leftovers for lunch. He has been seen making successful flights and landings throughout the day. It is unfortunate that he does not have his siblings here to fly with right now. 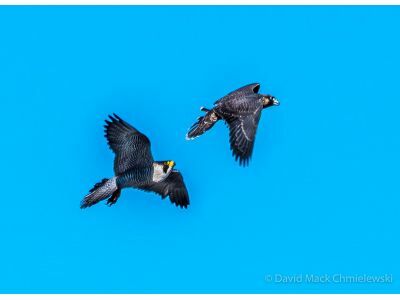 Young falcons spend much time together in the air and learn skills from their play activity. Hopefully his siblings will be returning home sooner than later and they can regroup. There is a 50% chance that a young Peregrine will be grounded on the first few flights. Since there are three chicks this year, I hoped the statistical gods would smile on us and only bless us with one grounded falcon. However, the dice did not roll that way. A very heartfelt thank you to all the people who took the time to report the young falcons on the ground and to help in the recovery efforts. The response of the Kalamazoo community is wonderful and is responsible for the success of these birds. My apologies to those who took the time to call and text and did not get a response. The first calls resulted in the fast recovery and although the phone continued to ring and beep, there was no opportunity to answer during the action. All the calls and texts were important and very appreciated.